Nothing says “freedom” quite like a fat body with “super Trample”, am I right? 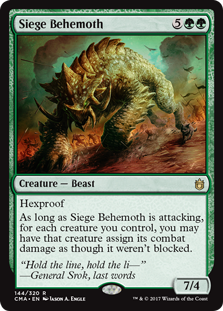 Siege Behemoth brings with it the weird “Trample but don’t call it that” variant that lets you completely ignore blockers to just smash faces in, this time spreading it to your entire team. Hexproof makes it likely that you’ll get at least one attack off with the team, and it also makes it less likely that your seven-mana investment will meet with an untimely and unfortunate death experience. Siege Behemoth is nice for making sure your army can’t simply be chump-blocked. If you want to just go for the throat, you can do so and maybe end the game. But doing so does carry a small risk: if they live through your attack, your creatures may all be dead, and they may not be nearly as bereft of life, as assigning no damage to their creatures will ensure their hits land all the same. I think Siege Behemoth here is an interesting riff on the inevitable or “unsolvable” big green creature. I’m not sure whether its having the “super trample” ability is entirely better or entirely worse than regular trample, as you’ll have to choose between taking out a blocker or taking out the opponent. Still, seven mana to get a basically-guaranteed seven damage to your opponent every turn is not a bad deal. It’s not as widely useful as some big green creatures and depends on your opponent’s deck to a certain degree – four toughness means it’s not as good as you’d like in the big green creature mirror – but it has its place.